Since I joined the Twitter community, I've 'met' some really great writers and read some fabulous books as a result of those introductions. I've also read and still read some great book blogs, Jill's being one of them. Judging from what I've seen, something that's hotly debated time and again is whether a writer should aim to be published or to go the self-publishing route. I'm one of those hybrid creatures. I've done both! Two of my books are self-published: my first, African Ways, and my latest How to Breed Sheep, Geese and English Eccentrics. 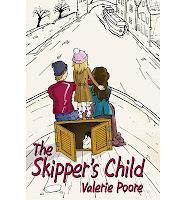 The middle two books, Watery Ways and The Skipper's Child, are published by Sunpenny Publishing. So why the mix? Like most writers, I've been writing my whole life, one way or another. When I was living in South Africa in the eighties and nineties, I started writing short stories and radio plays for broadcast on local radio stations. I also had a great job as the communications manager of a largish company, which meant I wrote a lot there too - advertising copy, brochures and that sort of thing. But I didn't start writing for publication until I came to the Netherlands where I now live. Without a creative job, I needed a creative outlet, so I decided to try writing a book. My first two books, both memoirs, were self-published. In fact, I wrote them on a blog and had readers encouraging me all the way through. It was a great way to keep myself motivated and I would recommend it to any first time writer. When I decided I wanted to publish my first book, I used Lulu.com, the POD company. I just loved the experience of creating my books. I took hours over the formatting, although now when I look at them again, I see all the mistakes I made! Even so, they weren't all that bad. The problem for me was the marketing. You might think that's strange coming from someone with my background, but I live outside my own language market, so it was really difficult to reach people effectively and promote my work. The result was that I submitted my second book Watery Ways (a memoir about living on a Dutch barge) and The Skipper's Child, the 'kidult' novel I'd just finished, to Sunpenny Publishing in the UK. They were just about to launch an imprint called Boathooks Books, so I thought it would be perfect to have my books published in my home market. The experience has been great! Sunpenny are enthusiastic, professional and supportive. However, as with all publishers, when it comes to marketing the author still has a lot to do. In many respects, the promotion of a published book is a joint effort. But, and this is a big but, it leaves me with the problem I started with. I am not in my home market or my language market, and it's becoming increasingly difficult to find new outlets and interest in a small country - one with an even smaller English reading market. So when I reached the end of my latest novel - the one about the sheep and eccentrics - I had a re-think. The production of the book itself, while being a lot of hard work and costly for a publisher, is actually the easier part. It really is! And I think most authors now agree that promoting their work and selling books is the most challenging aspect of a career writer's job. It's the one that just goes on and on. Hence my decision to take the 'easy' route and self-publish the fourth book. I don't have the back-up, it's true, but then I don't have the pressure to promote this one either. For the moment, two in publication is enough. Besides, most people are more interested in my watery world than anything else anyway. I might add that my current work in progress is a sequel to Watery Ways. That says something about market forces! Many thanks for this opportunity, Jill! It's been great to be here! I liked reading the two perspectives, Val. It is interesting now to hear that there are traditionally published authors choosing to go indie rather than renewing their contracts, and I wonder if control and some of the issues you brought up ( having to do your own marketing anyways) are some of the reasons we are seeing that shift. Thanks Anne Marie. I know I'm not the only one who has gone the hybrid route. I won't rule out being published again, especially for my sequel to Watery Ways, but for the moment, I feel I have enough to do to promote the published books at talks and presentations. It's great that we have the choice now to either go the Indie route solely, or do the hybrid thing. It's a case of what works best for both you and the publishers in the end. As an added note, Sunpenny themselves are going hybrid and are going to be offering packages of services on a pick your own basis. How refreshing - someone saying there are pros and cons to both! I'm so tired of the foot-stamping of some indie and professionally published writers. It doesn't have to be an either-or. Jo, you're right. It doesn't! 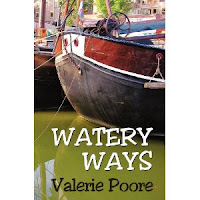 If I have an image at all, it's as a writer of waterways books, so I am happy that my published books follow that path and I hope they will still. This latest book was quite a departure for me, so that was yet another reason for going the Indie route with this one. Thanks for commenting! It's interesting that you wrote your first two books on your blog Val. I would love to hear more about it. I also like your idea of self-publishing. If I ever get my act together that's most likely the route I'd take. Jill, thanks for hosting Val! Like Val, I have also done both the Trad and the Indie routes. Either way, it's hard work, but each way is satisfying in its own right.